An undertaker with a display of coffins. 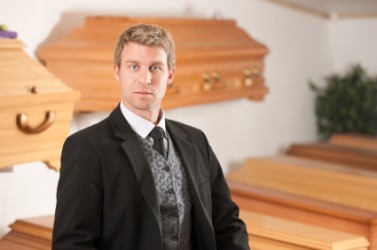 The definition of an undertaker is a mortician or someone in the business of readying dead bodies for a funeral and setting up and conducting a funeral. A man who runs a funeral home, plans the funeral, embalms the dead person and oversees the funeral is an example of an undertaker. "undertaker." YourDictionary, n.d. Web. 09 April 2019. <https://www.yourdictionary.com/undertaker>. One who undertakes a task or job. (historical) a person receiving land in Ireland during the Elizabethan era, so named because they gave an undertaking to abide by several conditions regarding loyalty to the crown, marriage, and using English as their spoken language. In 1588 Edmund Spenser becomes an 'undertaker' in the first Elizabethan plantation, receiving the forfeited Irish estate of Kilcolman Castle. A local undertaker had mummified him and placed him on display at his funeral home. Typically, a doctor, undertaker, or county official took down as much information as possible about the deceased person. This is a vast improvement over earlier games where created wrestlers were forced to "borrow" finishers from real counterparts like the Undertaker or Randy Orton. The word Libitina then came to be used for the business of an undertaker, funeral requisites, and (in the poets) for death itself.